By Ola Gustafsson for UGG. 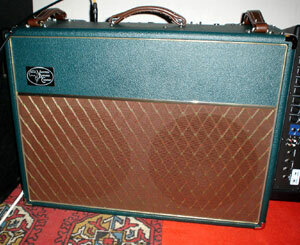 What if a guy walked up to you in the street and offered to sell an early sixties AC30 for half the street value? If you are anything like me you'd be tempted to jump at the opportunity. At the same time you would probably be very suspicious about the amp's origins. Most likely it would have been the result of some poor starving musician's van being broken into. Rob at Valvetech now claims to offer us this once in a lifetime opportunity without any moral or legal problems. Yes, he is selling a handmade point-to-point wired AC30 copy that was designed like a Top Boost from 1963 (or '62) without the tremolo channel. What's more amazing still, he does it with a price tag well below what you'd normally pay for a good boutique amp. There should really be an award for this kind of committment to bringing us good tube amps at a decent price. After hearing that a Hayseed had landed in Stockholm, I just had to chase it down ant put it to the test. Olle Norin was kind enough to let me abuse the amp for as long as needed and I was very much impressed by the high quality sounds and beautiful appearance of this extraordinary amp. The night before trying the Hayseed, I played for a while on my own mid 60's Tob Boost Vox. Every time I do this I get "the time machine effect". All of the recordings that shaped my idea of what an electric guitar sounds like, come back to mind. In my mind, the Vox AC30 is as closely associated with electric guitar as the name Martin is with acoustic guitars. No other amp that I've heard is as instantly recognizable as these. I'm sure many of you have played and tried AC30s, but to me, it is characterized by a shimmering treble, quite a lot of compression and an almost seamless crossing from clean to distorted tones. Even though it is brighter than a lot of other amps, it never gets hard on your ears, nor does it breach the boundaries of the guitar pocket in a band mix. This is an amp that doesn't need reverb or delay. It fills the room anyway and comes alive at the tip of your fingers. It will also cost you an arm and a leg if you're set on getting the real deal. If the Hayseed gets anywhere near, it has to be a bargain. The Hayseed that I was fortunate enough to get my hands on was ordered by Olle Norin from Rob at Valvetech (http://www.valvetechamps.com). It is the 2x12 version and came equipped with Weber speakers, one alnico and one ceramic, both rated at 25W, according to Olle. 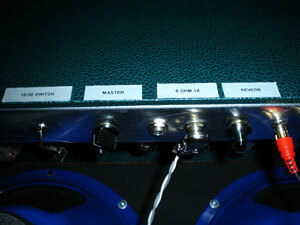 The amp has four inputs, two of which go into the brilliant channel and the other to are used for the normal channel. Two volumes, two tone controls and the hi cut knob is what you'll find on the panel along with the standby and power switches. The half power switch, the reverb and the master volume are hidden inside the cab but are easy enough to reach when you need to. They are more of the set-and-forget variety anyway. In order to give the amp a thorough test drive with some sort of sound reference, I brought my standard telecaster and plugged straight in. I first tried the brilliant channel and turned up the volume halfway with most other knobs at 12 o'clock. At first, the half power switch was engaged, some reverb was mixed in and the master volume was set halfway. I realize of course that these features are useful and appreciated by a lot of people, and they do make an amp flexible. My gut reaction however was to bring the master all the way up, engage full power and turn off the reverb. Removing all of these "obstacles" to guitar tone opened up the amp and it started to breathe. It's like a small animal that has to be set free before it really thrives. Like a lot of other amps, this one needs to be cranked to sound at its best. I tried both channels set halfway and at 2 o'clock and this is where you'll find that the amp starts to give something back and assume the role of an instrument in your music. The brilliant channel is where a lot of the magic happens. There is no mistaking the heritage of this amp, once it gets started. And yes, It does the Vox thing and admirably so. Even though this was a loud setting, the amp itself was still quiet and there was little tendency for feedback even though I was standing really close to the amp. It was possible to provoke some nice sustaining notes while facing the amp, but it was more stable than my Vox. My feeling is that a little bit more gain could slightly improve things in this department and it would make the amp a bit more touch sensitive as well. It's not for everyone though and I can see how this set up makes for a more versatile, modern and pedal friendly amp. 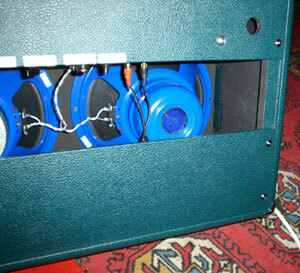 Olle plays this amp alongside a Hiwatt using an impressive pedal board. He says that the same pedal settings work well with both amps. The Hayseed has a tighter low end and more headroom than what I'd expect from a Vox. The trademark sounds are there, bur it feels more controllable and appears to be wider in the frequency response. It reminds me of an AC30 piggyback with a closed back cabinet that Fred owns. Much like the closed back AC30 cabinet, the Hayseed has a distinct low end and a somewhat darker and bigger sound. I'm sure a lot of this is attributable to the choice of speakers. If I decided to get one for myself I'd order it with Celestion Blues instead of the Weber speakers. On the other hand, the Webers probably allow for it to cover a wider ground musically. I would say that the low end peaks at a slightly lower frequency than in my Vox, but it is still quite focused and handles really well even at loud volumes. My general idea of a Vox sound is one that compresses early in the high end and therefore rarely gets hard on the ears. I attribute this to the relatively low power of the amp along with the choice of speakers. This Hayseed posesses these same qualities as well, and produces good sounds at almost any setting. Only really good amps seem to do this. In my view, the treble characteristics are what allows for the smooth transition from clean to dirty tones just by turning the volume knob on your guitar or digging in a little harder with the pick. You will find this in the Hayseed, just as you would in a good Vox amp. The Hayseed reacts the way you want it to, remains quiet and reliable and and stays controllable when you need it to. This is an amp that needs to be cranked to sound at its best. It comes equipped with a half power switch but I believe the master volume and reverb are optional. Personally, I don't feel the need for any of these and would prefer a simple attenuator to achieve the sound levels required for use at home or in small clubs. I would however go for the EF86 option as this should bring the amp closer to the original earli sixities specs of the AC30. I don't know if this particular amp had an EF86, but reading about it makes me want to try it. I'm partial to single coil guitars and this test drive was carried out exclusively with a telecaster. I'm sure the Hayseed would more than welcome a Les Paul Style guitar and seeing that most modern guitars have higher output pickups, my concerns about the gain deparment may be unfounded. 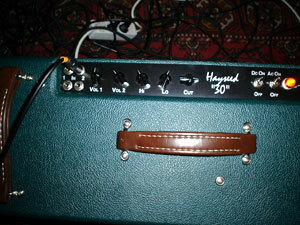 The Hayseed is a great amp. For the price, it is really hard to beat if you want to get some of the magic. In many ways, it comes across as a very healthy alternative to buying a vintage Vox. Honestly, if you are a fan of Vox amps, would you take your vintage amp on the road with you, or for that matter, leave it in a rehearsal room? I'm sure many of us would hesitate, but maybe not so with the Hayseed. It's brand new and seems built to last, has better ventilation, is probably easier to service for the experienced tech and would probably cover a wider range of sounds than your average Vox if it needed to. A lot arguments are in favour of the Hayseed, and we'll probably see a lot more of them in years to come. Admittedly, it doesn't project quite as well as a good vintage Vox does, and for some of us, there simply aren't really any alternatives to buying the real thing. For others, the Hayseed is a true bargain.